megawhat.tv provided us with a video from LEGO TECHNIC Off-Roader (8297) exhibited at Toy Fair 2008 in London, last weekend. 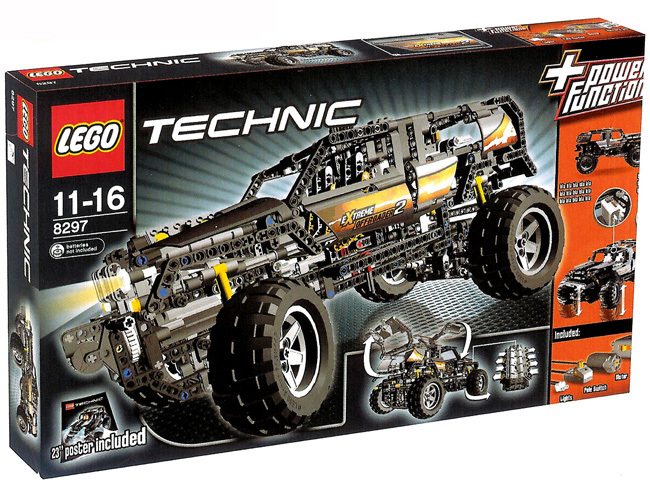 The new LEGO TECHNIC flagship for next Christmas. See it here in action (between 0:00:40 and 0:02:00 aprox.)... lights, winch, raising suspension and everything we have been talking about , . It is a pity because it could have been just the great opportunity to see the new Linear Actuators in action. I've embedded the same video, but from a different source. My god it's a amazing, I want one of this. I really look forward to learning more about the other two sets being released. I still think the red switch under the car is connected to a gearbox-like mechanism, like the one used on the Cherry Picker, to change the function powered by the motor: the winch or the suspension. To turn the light on or off, it would be very difficult with only mechanical means; the pole reverser would be ideal for that. The rising suspension seems to be weak. It functions through 2 stud liftarms such as this*. It could easily break down with the weight of the truck, am I wrong? I believe is the one pointed by avcampos, because as far as I understood the mechanism, it must fit into aa axle in one end, and with a pin (that connects to the suspension) in the other.